William David Edwards was born to Evelyn and Walton Edwards on October 5, 1924. William occasionally went by the common nickname for someone named William: Billy. He was born and raised in Fresno, California. His mother, Evelyn Phillipson Edwards, worked as a clerk while his father, Walton Edwards, worked as an electrician at a power company. William was the youngest of three children. According to the 1930 census, the family lived in Fresno, California. William had two brothers, Harvey and Phillip, both 12 years old at the time of the census. The 1940 census shows that William’s father had died as his mother’s marital status changed to “widowed.” The family lived on South B Maple Street in Fresno, California. William Edwards graduated from Theodore Roosevelt High School in Fresno, California. He started working as a sales clerk when he was drafted into the U.S. Army in 1943. He was about 19 years old at that time and was unmarried with no dependents. The headstone and interment record states that Evelyn Edwards, his mother, was the next of kin. Edwards lived in Fresno, California during the Great Depression and World War II era. Many factors contributed to the united war effort that led to the success of America in World War II. Agriculture was one of several Californian contributions to the Allied victory. Along with the other counties, Fresno and the rest of the state of California greatly contributed to the victory garden effort. By 1944, these gardens, grown to help prevent food shortages, produced more than 40 percent of the nation's food. Located in the Central Valley, Fresno was not only home to the household victory gardens, but they also had a thriving agricultural center due to its sunny temperate climate. Fresno was home to many German and Japanese POWs. The prisoners in the POW camps worked in the fields, making Fresno especially agriculturally sound. Statistics show that during the 1940s agriculture in California increased by 16.4 percent. The U.S. government eventually bought the Intercontinental Rubber Company and established a second mill in Bakersfield, California in 1945. The rubber mills of California were fundamental to the war effort. California was also used to hold many different training camps because California has such diverse climates. It was an appropriate state to build training centers in because it simulated the different climates in Europe and the Pacific. William Edwards was part of the 83rd Infantry Division nicknamed “Ohio” because of the location where the division was raised in World War I. The 83rd Infantry Division participated in greuling fighting in the Normandy Campaign. Between June 1944 and May 1945, the division suffered almost 24,000 losses (over 15,000 combat casualties). On June 18, 1944, the 83rd Infantry Division advanced toward Bricqueville, France after landing on Omaha Beach. On June 22, 1944, the 83rd Infantry Division moved from Bricqueville to Auvers, to assemble and relieve paratroopers from the 101st Airborne Division. The infantry relief was accomplished on June 28, 1944. However, their journey was just about to begin. On July 3, 1944, the 83rd Infantry Division closed in on Méautis, France in preparation for the attack on July 4 that was supposed to drive the enemy to the southwest. On July 4, 1944, when the men of the 331st Infantry Regiment attacked, they were met with heavy machinery and artillery in the vicinity of Sainteny. This continued for several days with continuous reinforced attacks in the mornings taking place as the U.S. tried to force the enemy out. Heavy casualties necessitated reinforcements. On July 14, 1944, the morning report showed that Edwards, along with dozens of other men from the 92nd Replacement Battalion, joined the 331st Infantry Regiment to continue the battle. The 331st Infantry Regiment moved slowly because of the thick hedgerows and because of the heavy artillery the men had to pass through. After Operation Cobra was launched on July 25, 1944, the division was ordered to take Le Village de Saints, on July 27, 1944. Edwards most likely died from artillery and mortar fire on July 29 as the regiment defended positions around the village of Camprond. He was one of the 240 soldiers that were killed in action in the month of July. He was awarded the Purple Heart, and his death was reported in a Morning Report on August 3, 1944. The 83rd Infantry Division not only fought in Normandy and Brittany, but also took part of in the liberation of Luxembourg. They fought in the Ardennes and the Rhineland, and were the first to reach the Rhine River. They literally raced across the rest of Germany, covering 280 miles in 13 days and were within 60 miles of Berlin when they were ordered to stop. William D. Edwards paid the ultimate sacrifice while fighting in a war that determined the fate of humanity. Leaving his family behind knowing that there was a chance he would never see them again takes faith and grit. Edwards, without hesitation, left his life behind to fight the enemy day in and day out. This Silent Hero touched millions of lives through his service in the U.S. Army and he was surely missed by everyone who was lucky enough to know him. Edwards showed that he was willing to risk his life for the rest of the American citizens by fighting for his country. He could never hide his passion for helping others. His kind-hearted soul never took moments to think about himself, his mind was always focused on other people. Edwards had a good life going for him; he was enrolled in school and had a job, yet he was still eager to give his steady life up to help others. By going to college, Edwards highlights the perseverance and passion he has instilled within him. I can only imagine the pain his mother must have felt when she received the telegram stating that her son had died in action. What she had to go through should not be endured by any mother, but I hope she and her other children realized that he died while doing what he enjoyed, helping others. He will always be remembered for the kind-hearted, selfless hero that he was when he died. The story of William Edwards caught my attention from the very beginning. I have been to Fresno (Edwards’ home town) and the surrounding areas countless times, which allows me to develop a personal connection with him. Knowing that I have been in the Fresno area makes me wonder if I have ever stood in the same place, or looked at the same things as he did many years ago. He feels even more like a friend to me because I find it astonishing that I know we have shared the same sites. It is an amazing experience to feel a connection with someone that I have never met. I have built a sense of knowledge for my soldier through this project. I am thankful to build these connections with him and give him a second life through the details that I have collected pertaining to his life during my research. I find comfort in knowing that Edwards spent his last days fighting for his country that I now get to live in and cherish forever. This project has given me the chance to take a look at America’s past and understand the history behind these fallen soldiers. It has given me the opportunity to praise and thank those who have served this country. This project has also helped me appreciate the free life I live, and has helped me realize that I owe it to everyone who has fought for this country. I am forever grateful to all the men and women who have served this country, especially Edwards because he paid the ultimate sacrifice. I am honored to be the person who gets to give him a voice. His legacy will live on forever through this memorial. William Edwards became a lost name in history, but I hope with this memorial I can honor him and his legacy. 331st Infantry Regiment, 83rd Infantry Division. Morning Report, July 14, 1944. Digital Images. 83rd Infantry Division Documents. Accessed October 3, 2017. 331st Infantry Regiment, 83rd Infantry Division. Morning Report, August 3, 1944. Digital Images. 83rd Infantry Division Documents. Accessed October 3, 2017. California. Fresno County. 1930 U.S. Census. Digital Images. http://ancestry.com. California. Fresno County. 1940 U.S. Census. Digital Images. http://ancestry.com. Records for Edwards, William D; World War II Army Enlistment Records, 1938-1946 [Electronic File], Record Group 64; National Archives and Records Administration [retrieved from the Access to Archival Databases at https://aad.archives.gov/aad/, 13 January 2017]. 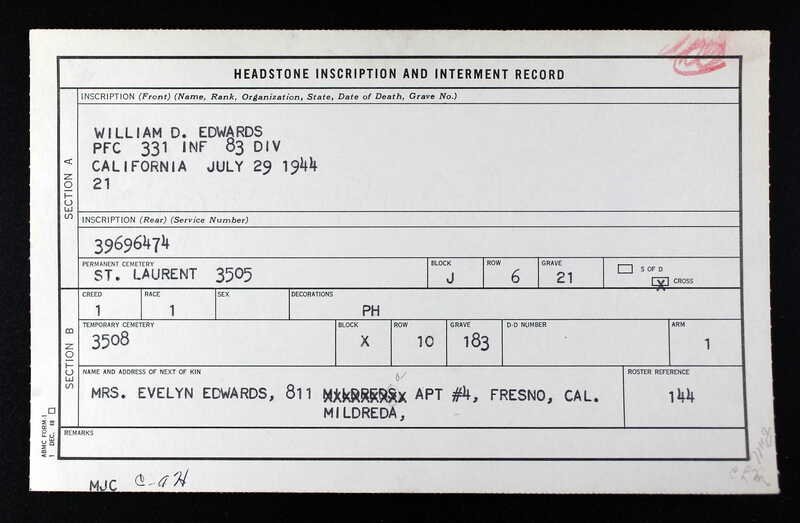 William D. Edwards, Headstone and Interment Records for U.S. Military Cemeteries on Foreign Soil, 1942-1949. Digital Images. http://ancestry.com. William D. Edwards. October 5, 1924. 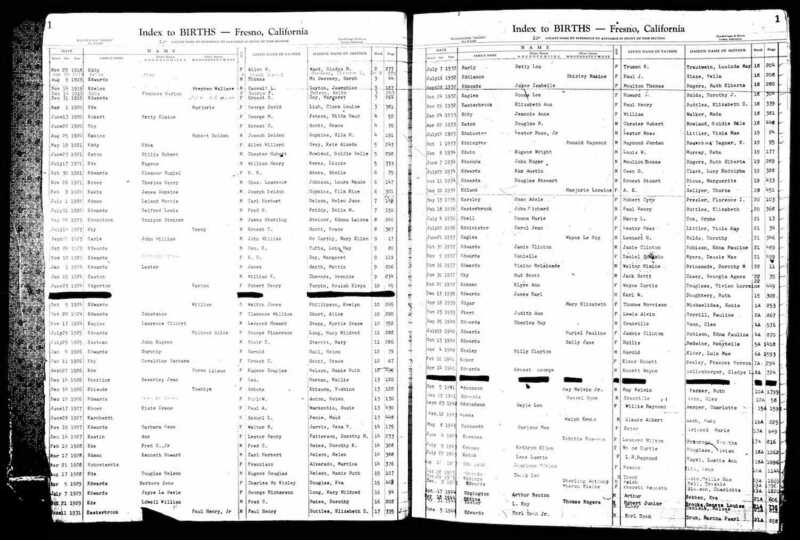 California, Birth Records from Select Counties, 1872-1987. Digital Images. http://ancestry.com. "Edwards, William D." American Battle Monuments Commission. Accessed January 14, 2017. https://abmc.gov/node/408331#.WJO08hsrLIU. "The 83rd Infantry Division." United States Holocaust Memorial Museum. Accessed April 26, 2017. https://www.ushmm.org/wlc/en/article.php?ModuleId=10006145.